A landlord was left in utter shock after discovering tenants had turned their luxury condo in Pattaya into something resembling a rubbish dump - and then disappeared without a trace. 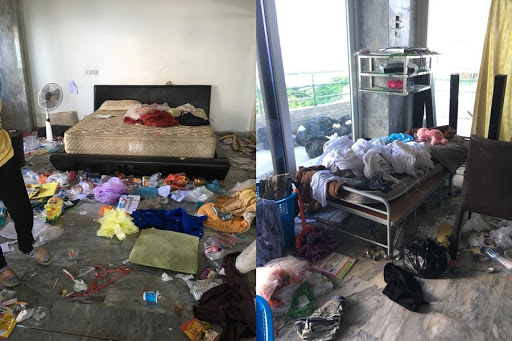 Photos and a video of the filthy state of the condo, which is reportedly worth 10 million baht, show large amounts of rubbish strewn across the floor, a broken toilet and curtains pulled from their railings. The photos were shared by Facebook user Jindaporn Ao Amam who is said to be a friend of the owner. According to Ms Jindaporn the condo was rented out two years ago to a woman and her two daughters who had up until recently been paying 30,000 baht per month in rent. However, when the rent stopped being paid the owner visited the property only to discover it had been left in a terrible state. The tenants meanwhile had long gone and haven’t been seen since. One of the photos shared to social media showed the tenant in the arms of a western man which people commenting on the post speculated was her boyfriend. Ms Jindaporn warned other landlords in Pattaya to be careful who they rent property too. Pattaya police are investigating and trying to locate the tenants. I woman and her two daugthers? Yeah it must be in the line for the rules and regulations of raising and educating your children to grow up to be responsible human beeings. call something else has broken,been blocked,etc,etc. 30000/mo. What was age of the daughters? Surely tenants must provide copies of ID cards/passports which even Pattaya Plod could track down? Rent to falang only with passport copied. Too easy. Being a Landlord requires frequent house checks as well as collecting rent. From my past experience lack of monthly checks can be expensive when tenants remove furnishings and destroy fixtures. OMG, what kind of people live like that? Absolutely disgusting. What kind of idiot pays 30k for a condo per month? Im amazed how people know the cost of everything but value of nothing. Meaning the costs to build these snap together condos is next to nothing per condo. Chicks probably a drug dealer/user. I'm always amazed that there are actually people out there that look relatively 'normal' but border on sub-human. I can't fathom voluntarily living in conditions like that, no less creating that condition for yourself in the first place. Nasty! I hope the condo owner is successful in catching and prosecuting whoever did that to their property. Sad.